Solid Color Stains – Solid color stains are opaque in color and give more protection than semi-transparent stains. Though this choice gives you the most protection due to a thicker film build, the only downside is that you will not see the natural wood grain in the deck material. Semi- Transparent Stains – Semi-transparent stains also known as semi-opaque, are thinner in viscosity when compared to the solid color stains. With this selection, you are able to see natural wood grain through the stains and the stains tend to penetrate deeper into the wood. For new decks with first time stains many people prefer this option. Natural and Clear Toners – This stain selection is best suited for a natural wood look. Offering the same protection as a semi-transparent stain this option provides the most clear and neutral look. Some of our available toner colors include Clear (natural), Cedar Tone, and Redwood Tone. The availability of oil based stains have decreased over the years due to strict VOC (Volatile Organic Compound) regulations. 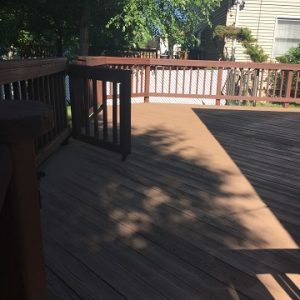 Depending on the condition of your deck and previous stain selections we can help to decide whether oil or water based stains are right for your project. Oil based stains offer great penetration into wood though they fade much quicker than water based stains. Water based stains allow for great color retention and has longevity in vibrancy. Be sure to discuss both options with your project manager.